Yasmin Lavery had her eye on the prize as she beat more than 1,900 people from around the country to win our special festive video competition! To be in with a chance of winning, participants had to keep their eyes peeled whilst they watched a film of our sales advisor Julie presenting a tour of The Canterbury show home at our Abbey Vale location in Evesham, Worcestershire. Viewers had to count the Christmas Hats that had been hidden around the four-bed property as the camera followed Julie walking around the attractive family home. 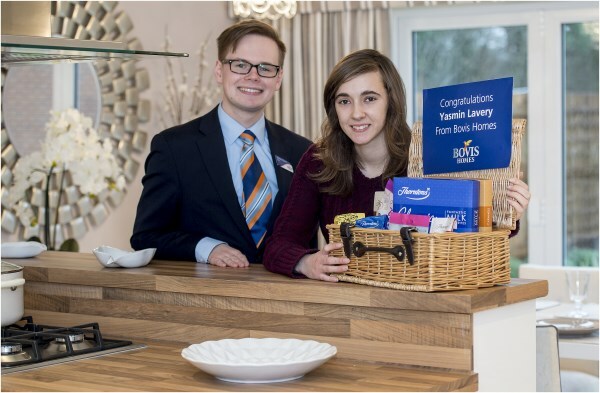 Yasmin, from Warwick, spotted them all to win first prize of a hamper full of chocolate, which she picked up from our sales advisor Zachary at our development in Leamington Spa. Keep an eye open for more fun competitions from Bovis Homes soon!